Sometimes, knowledge comes to us by a circuitous route. 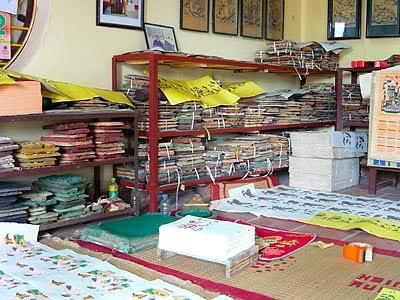 After I wrote about Vạn Phúc, the silk-weaving village outide Hanoi, a friend asked me if – there obviously being mulberry trees for the silkworms – there was a tradition of making mulberry paper in Vietnam. 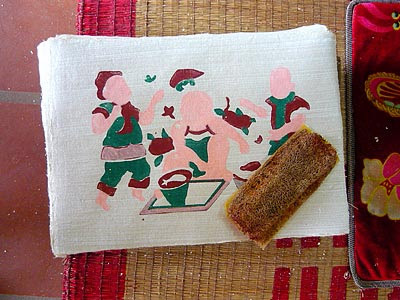 I was unable to find any such tradition, but in the course of searching for mulberry paper I discovered the folk art of Đông Hồ, a village 30 km. 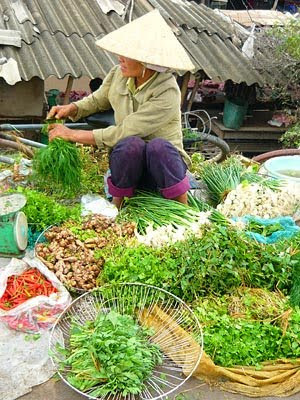 east of Hanoi. And so was born a quest to view this art at its source. 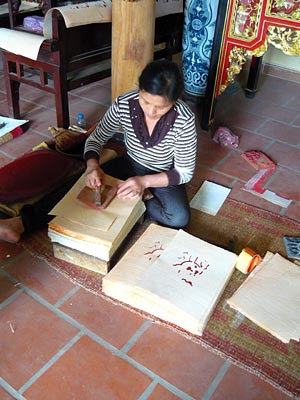 Đông Hồ is the center of a woodblock printing tradition that dates back 500 years. 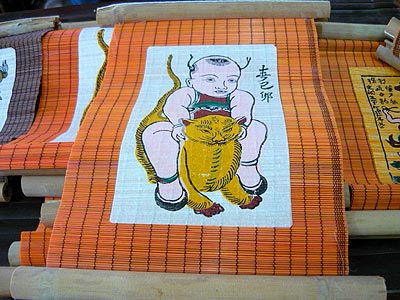 Đông Hồ pictures (Tranh Đông Hồ) are frequently displayed in Vietnamese households during Têt, the Vietnamese New Year. 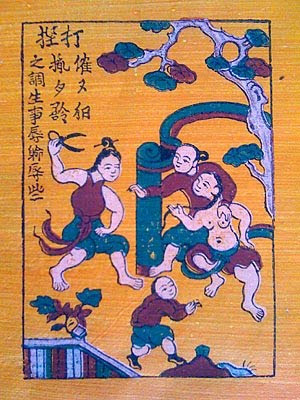 They typically depict a range of Vietnamese folk imagery, from traditional symbols of wealth and fortune, such as pigs, ducks and chickens, to bawdy tales that satirize the extramarital affairs of husbands and wives. 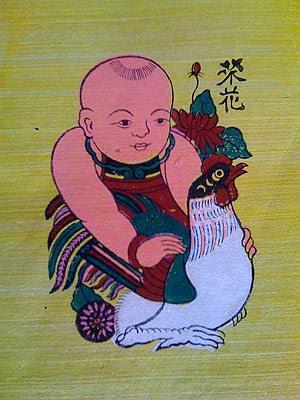 These subjects, together with the stylized manner in which they are represented, constitute the Đông Hồ style. 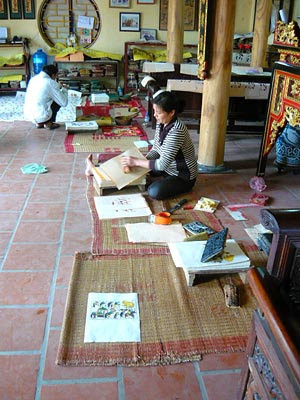 What makes Đông Hồ pictures particularly impressive is that they are made using traditional dyes and inks, and production processes that date back twenty generations. The paper is produced from the bark of the Dzo tree; the bark is soaked in water for months, then mixed with seashells and made into a thin, lightly textured paper stock, which is then sometimes tinted. The colors are made from crushed leaves, burnt bamboo, pine resin, copper rust, eggshells, and other natural sources. The prints are finished with a rice paste glaze that hardens the paper and protects the colors so that they resist dimming even after long exposure to light. Wanting to see this in person, I and a friend set out on my motorbike, on a drizzly Saturday morning, onto the northbound road to Hải Phòng. Forty minutes out from Hanoi, we veered off the main thoroughfare and began asking for directions. 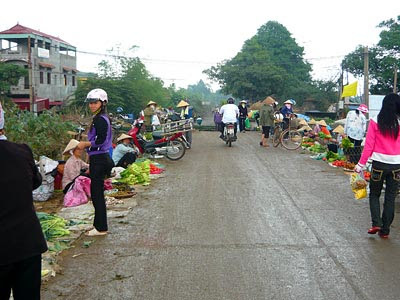 Just before the village, we stopped at a rural roadside vegetable market. Mounds of herbs both mysterious and familiar – dill, mint, and cilantro, alongside mồng tơi, mùi tàu, and rau răm – as well as twisted roots with medicinal powers, reminded me of the richness and antiquity of Vietnam’s culinary traditions. Were it not for a large sign announcing “Đông Hồ Pictures,” I might have ridden past the village. With only 10,000 inhabitants, Đông Hồ looks much like any other rural village in northern Vietnam: slim houses with crumbling stucco exteriors, interlaced with rough dirt roads. Upon entering the village, narrow alleys lined with piles of bricks (a brick-making factory lies outside of town) remind me that it’s building season in rural Vietnam as well as in Hanoi. Expecting a village built around its cottage industry, I was surprised to discover that only two households offer Đông Hồ prints for sale. We veered into a courtyard and entered a low, traditional brick house that had been made into a workroom and showroom. There we found a large family altar, and framed prints on all the walls – some modern, some as old as 200 years. Piles of wood blocks, their edges stained with ink, lined the shelves around the edges of the room, amid bundles of Dzo paper. Across the floor, hundreds of prints were drying, and between them a young woman repeatedly inked a wooden block, laid it carefully onto a paper, rubbed the back of the paper to make sure the ink adhered, and set the print out to dry along with all the others. We browsed, bought some pictures, and sat on a laquered wooden bench to wait out a sudden shower. While waiting for the rain to stop, I reflected on how Đông Hồ, in its way, symbolizes Vietnam’s recovery from its 20th century conflicts. What was once a thriving cottage industry nearly died amid the ravages of war. 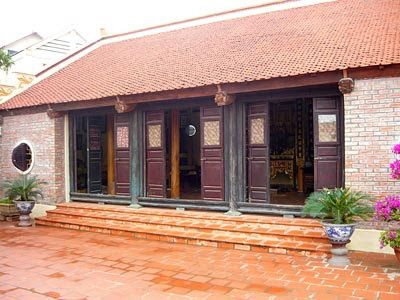 Only a few families maintained the tradition, and in the 1990s, when the market recovered, Đông Hồ’s pictures again began to be sold. 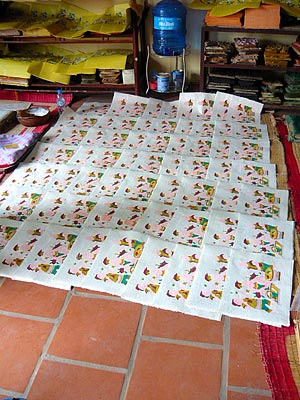 Today, as Vietnam pushes toward modernity, millions of Đông Hồ pictures are sold every year to both tourists and Vietnamese households, and there is every reason to think the young woman I saw making Đông Hồ prints will one day pass her secrets onto her children.